So who invented curry? India? Japan? The middle East? Well, whoever invented it knew what they were doing. Curry has such a pronounced flavor. It is familiar, yet exotic. As a Korean American, I ate the Japanese kind a lot growing up. Those solid blocks of curry, oil, and MSG was sometimes a common staple at home. My mom would make a big pot of curry, and we could eat for days. I would pour it over rice, eat it with some daikons or kimchi, and I was set. 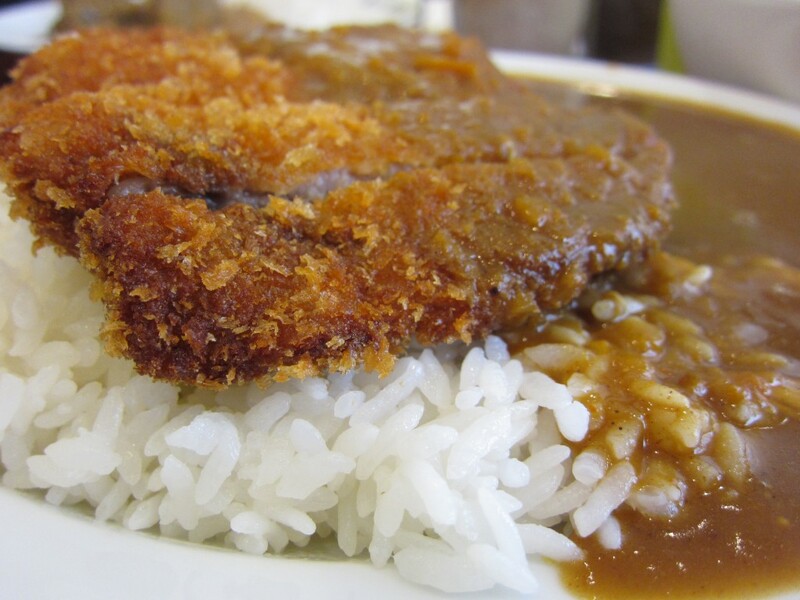 In Japan, peaople eat curry rice 125 times a year. 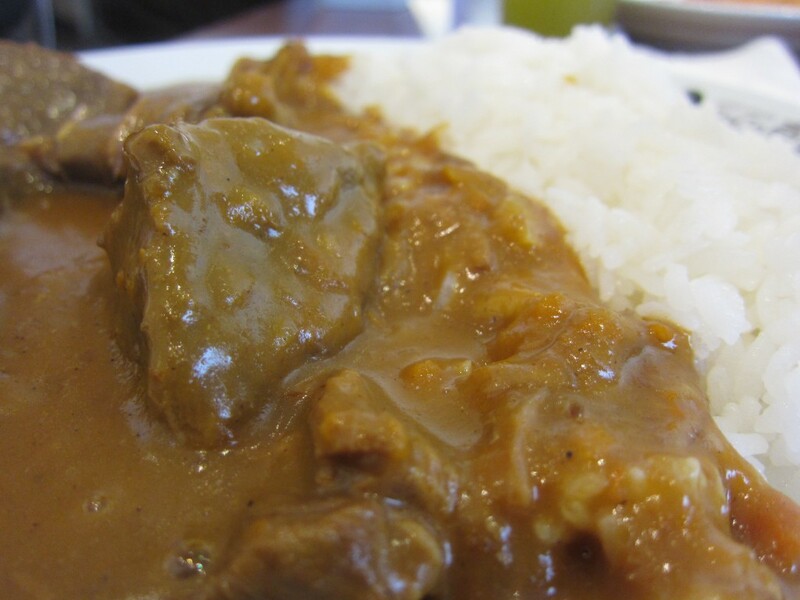 It is no question that curry is a popular dish in Japan. 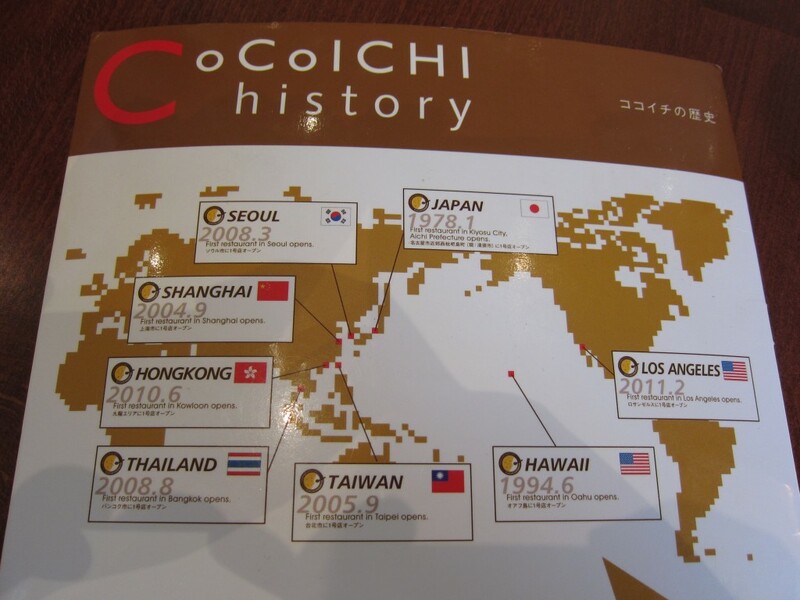 Coco Ichiban Curryhouse is all over Asian, including Korea, Thailand, Hong Kong, China, Taiwan, and of course, Japan. 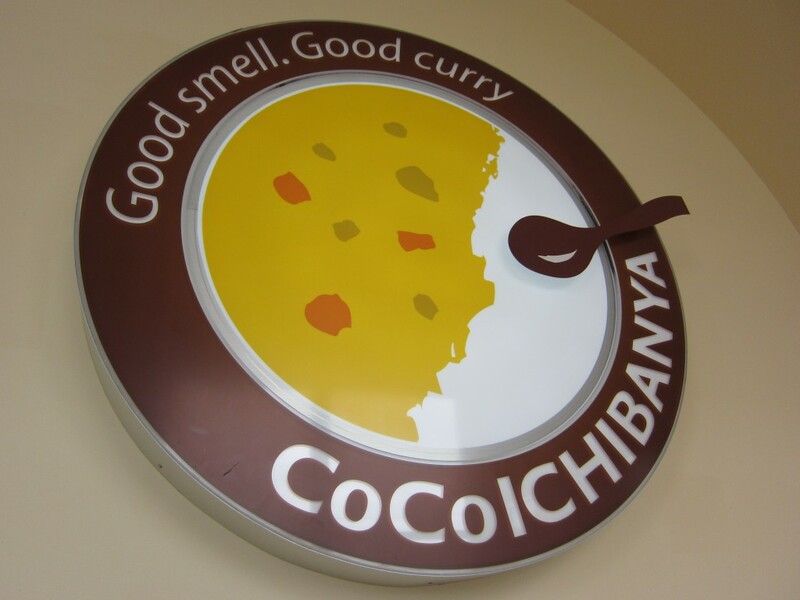 Southern California, more specifically Torrance, CA is lucky to have a Coco Ichiban. The dishes are tasty and cheap. There is a special way of ordering. You select the type of curry (base, spicy, extra), then you choose your rice proportion. As for me, I just got the regular base proportion. Finally, you can choose spiciness. They have 10 levels of spiciness, and I would like to try the highest level one of these days. Their salad in the beginning of the meal was a great start. 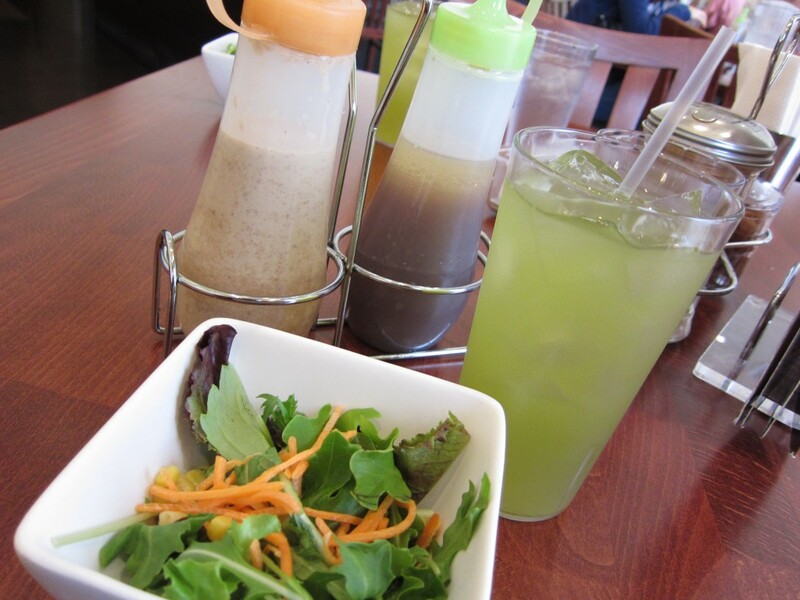 The sauces were very different, but the sesame vinaigrette was my favorite. I tried their pork katsu and the chicken katsu. Both were crispy and tender. The beef curry was very something that hit me close to home. My mom would make big pots of curry at home, and the main protein would just be beef strips. The beef in the curry at Coco Ichiban were huge, almost like beef chucks the size of golf balls. It was tender and had no signs of chewyness. This was definately a good contrast against the crispy katsu. Torrance is lucky to have Coco Ichiban. 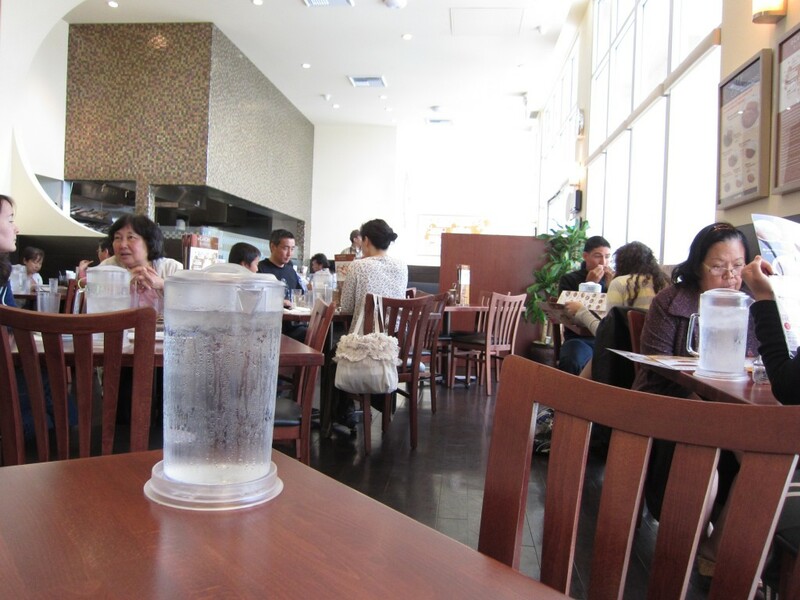 They offer cheap and good curry with a nice atmosphere. They offer different size portions and spicy levels. Really, I will try that level 10 one day. Sometimes, you come across a family operation, and the food just speaks for itself. 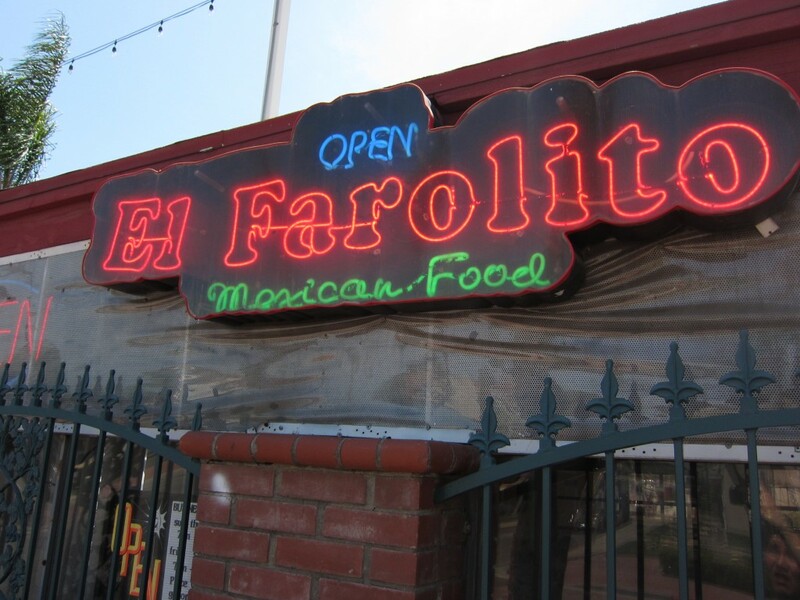 El Farolito has some great home comfort Mexican food. It is authentic as can be, and in the Orange County? No kidding. This is my favorite Mexican restaurant in all of Orange County, so far. Their food is simple, and really delicious. It is going to take a lot to take this off the top of my list. Every Mexican restaurant gives you those sought after tortilla chips. Whether they are bottomless bowls or just one platter, eating Mexican food without the complimentary chips and salsa just isn’t right. 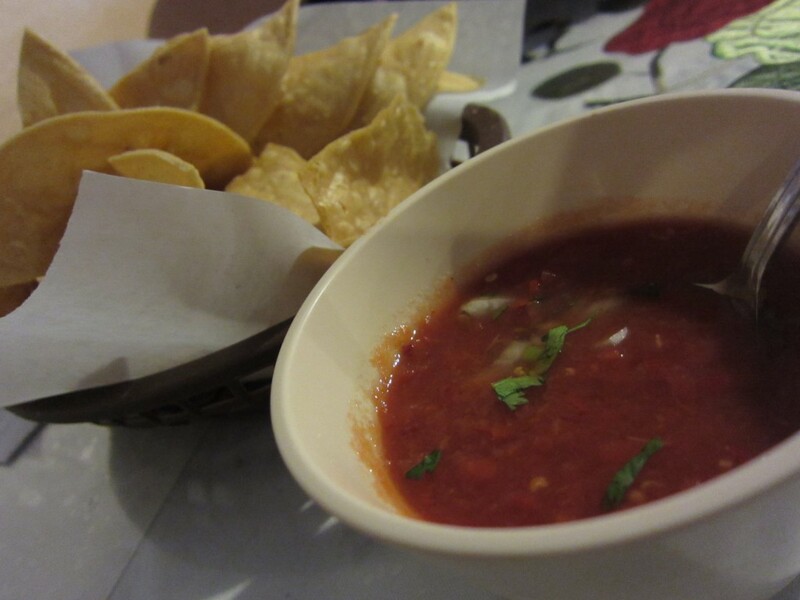 The one very minor thing I don’t like here is the salsa. It is a bit mushy, and doesn’t taste fresh. I like mine heavy with cilantro and chopped onions. Their tortilla chips are crispy. 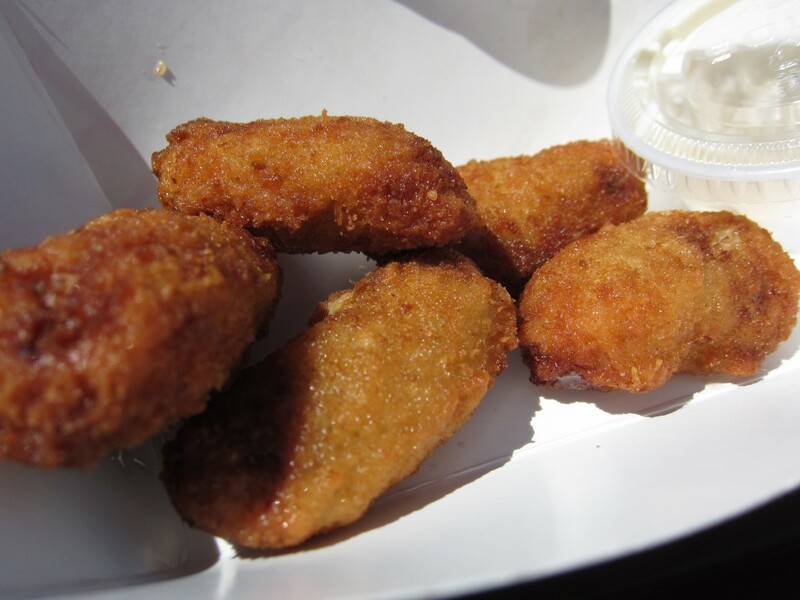 When I say crispy, I mean some people might not like it crispy — your teeth will hurt after, crispy. That’s not a good thing or bad thing. If you want to try some of the crunchiest tortilla chips ever, come to El Farolito. My favorite thing to get here is the carnitas. 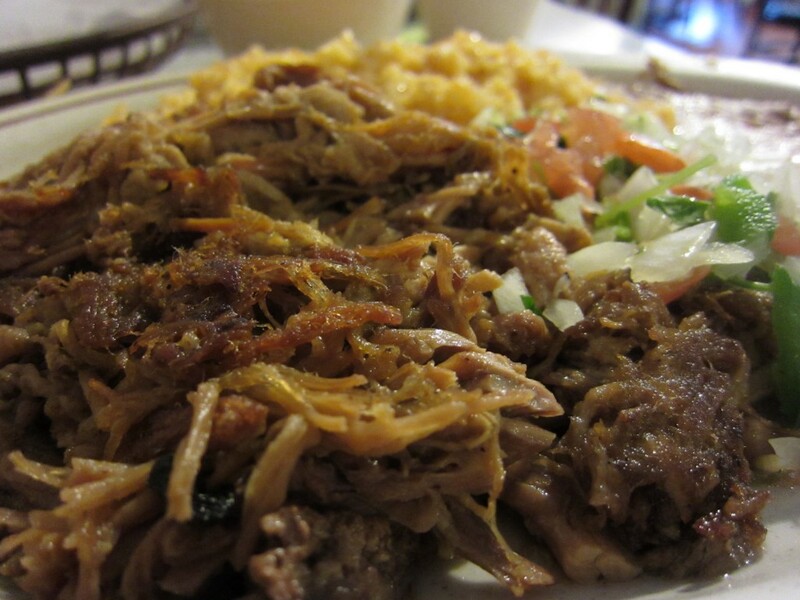 It is amazing how juicy and flavorful their carnitas is. Most carnitas I eat anywhere is usually dry or flavorless, kind of like cardboard. Theirs is so tender and flavorful, it is amazing. There is a nice crispy crust on the outside. The caramelization of the meat really is where all the flavor comes from. It is amazing with the rice and beans. It is such a simple dish, and I am a huge fan. 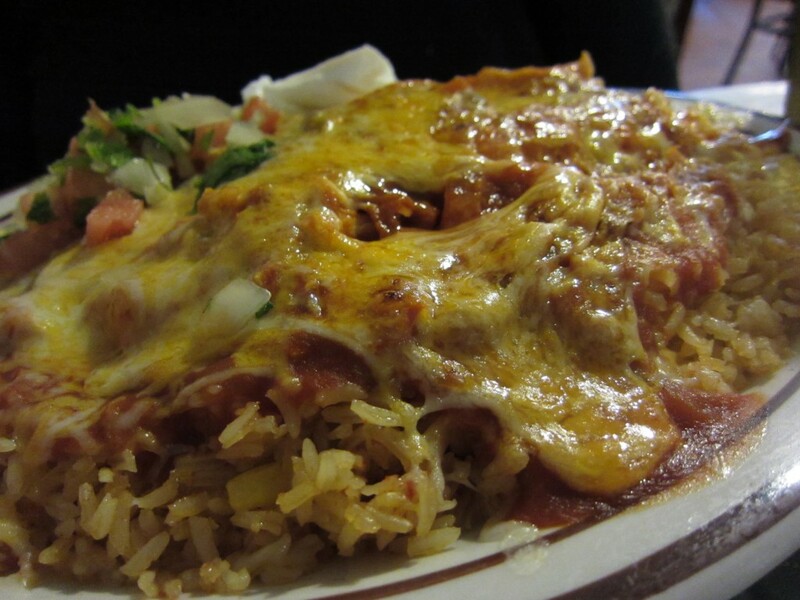 Their enchilada plate was amazing as well. The tortilla was so soft and tasty, and the cheese on top was great. You know how much I love cheese. Their enchilada sauce was very memorable as well. It had a nice rich flavor and the meet inside was amazing. It was a traditional dish and their portions were over flowing. I always take leftovers home. One wouldn’t expect such an authentic restaurant in Orange County. 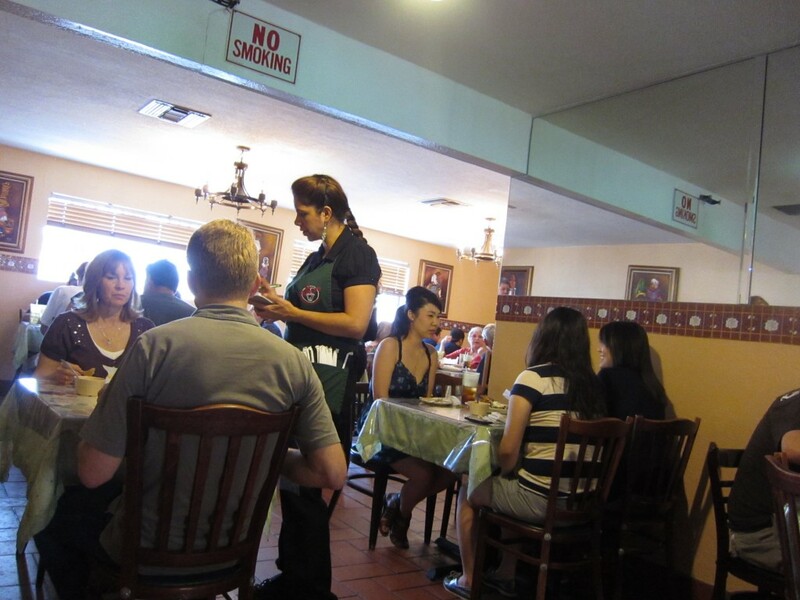 I have been all around some popular and authentic Mexican restaurants in Los Angeles, but this Orange County hole in the wall really surprised me. Honestly, it is as authentic as El Tepayac in Boyle Heights. The flavors aren’t watered down or changed. It is as authentic as can be. It is what it is, and it is goooood. 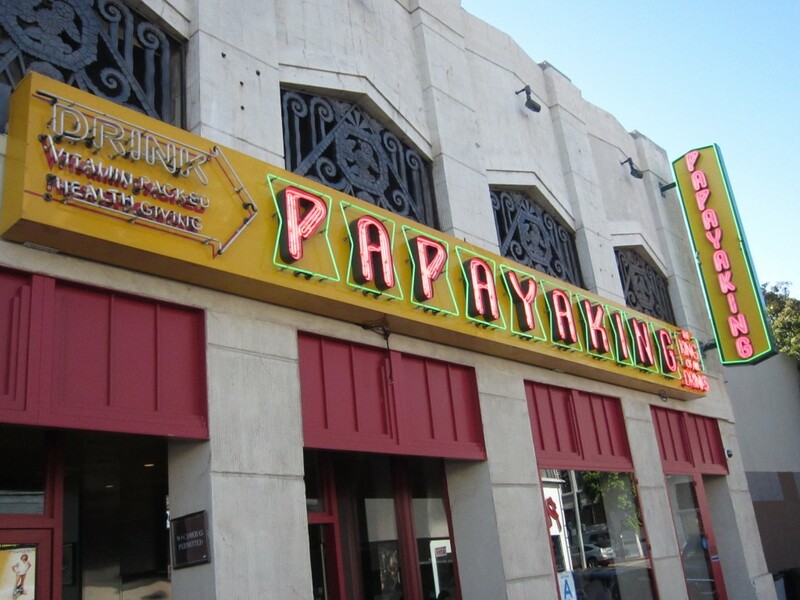 It took 80 years for Papaya King to come to the West Coast. 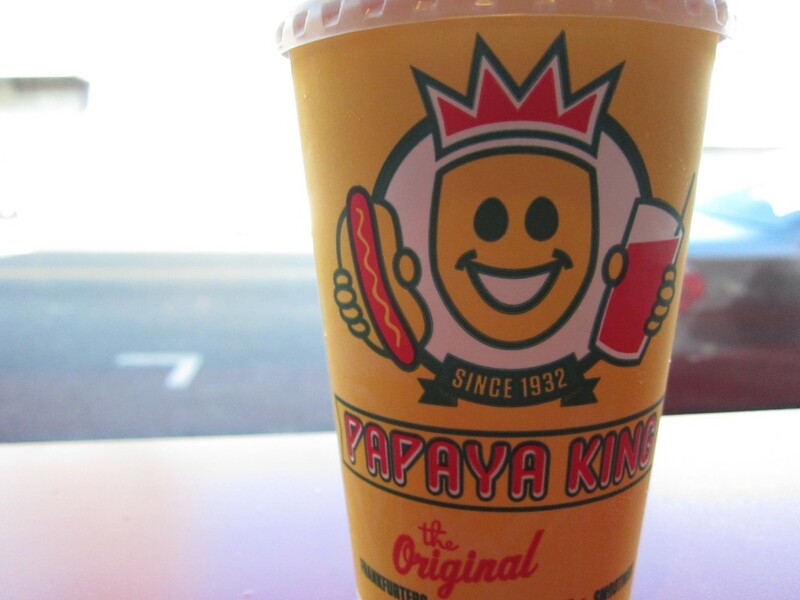 Anyone who lives in New York knows what Papaya King is all about. This is their right of passage. The Hot Dog of NYC. It went through countless years of media, press, and New York culture, and here it is now. Just a few minutes drive to Hollywood, California, and there it was. Go all the way to New York for some authentic NY hot dogs? No thanks. As a die hard Southern Californian, and a die hard Pink’s fan, I had to see what all the fuss was about. In a word, prejudiced. I don’t know if my California pride or my West Coast ways are clouding my judgment, but this wasn’t fantastic. Maybe I hyped it up too much in my head. In all honesty, the hot dog was tasty, but nothing really popped. 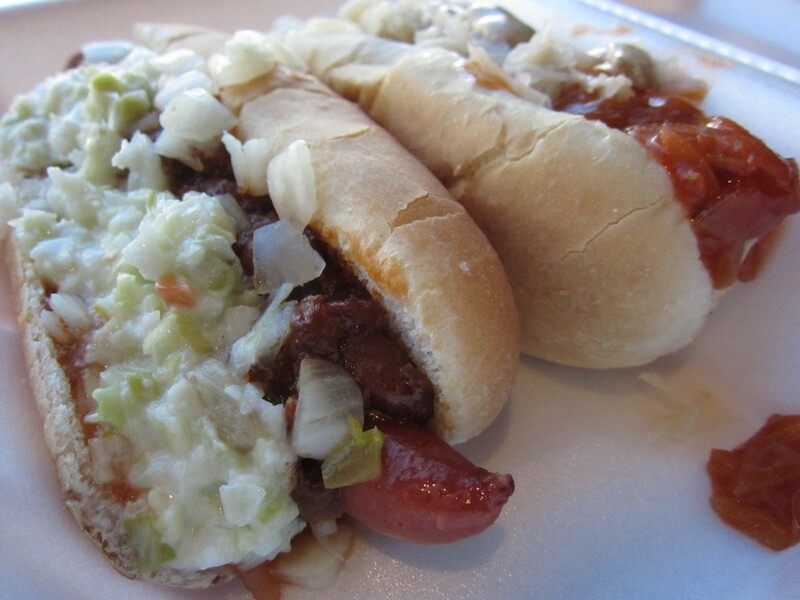 The NY style onions were too sweet, though I liked the sauerkraut — The chili was a bit salty. I am just a guy who wants a nice all beef dog with some mustard. That is it. 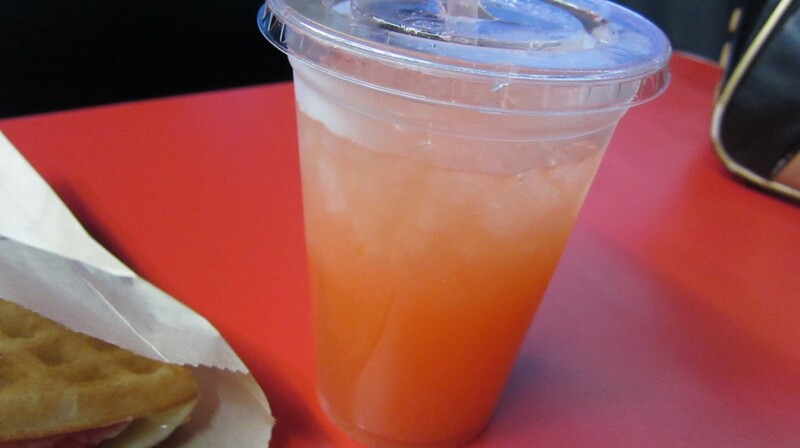 I did enjoy the papaya drink. It was like nothing I have ever had in my life. It wasn’t too sweet, and the bits of papaya were really good inside. I felt like I was treating my body right. It was healthy and delicious. Look, maybe all of the New York people will be mad at me for not liking Papaya King. Let me just ask you, do you have massive lines outside of your hot dog stand? When I think of the city of Westwood, I think of UCLA. 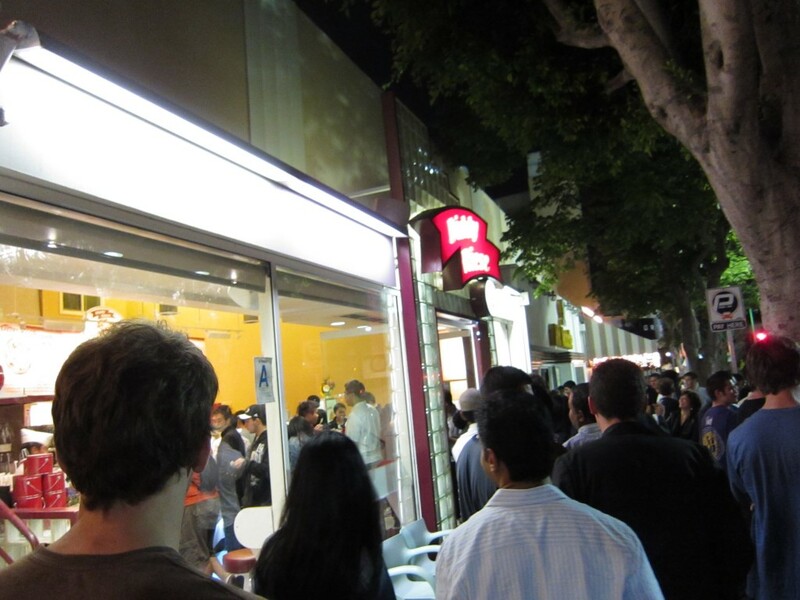 When I think of UCLA, I think of half of the Koreans I know, and Diddy Riese Cookies. 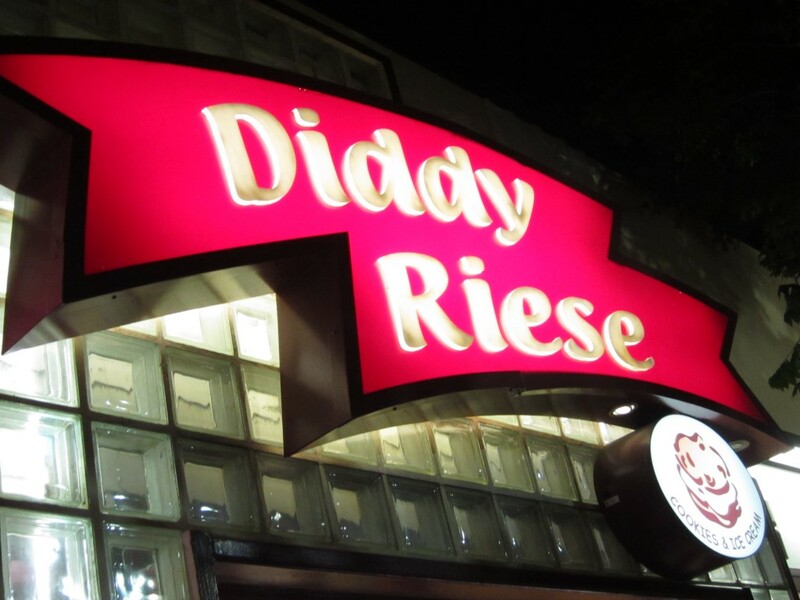 UCLA and Diddy Riese just go hand in hand. Diddy’s used to sell their sandwiches for a $1. Today, the prices rose 50 cents to $1.50. Expect to see long lines on the weekends as students don’t have class, or are off of class. 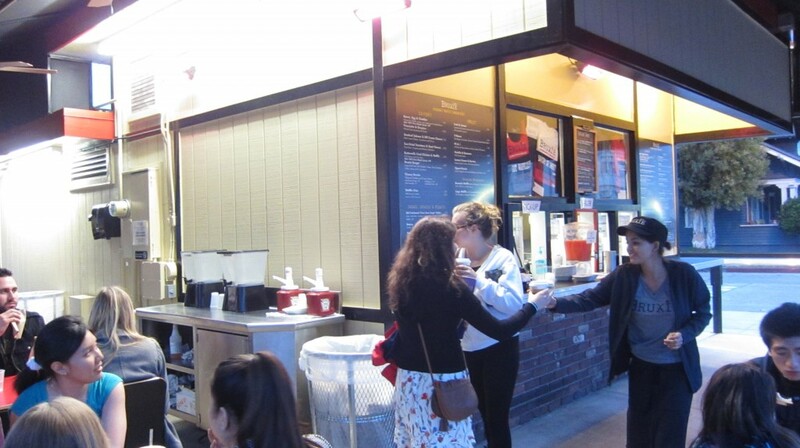 Since 1983, Diddy Riese has been serving cookies, brownies, and ice cream to all of Los Angeles. 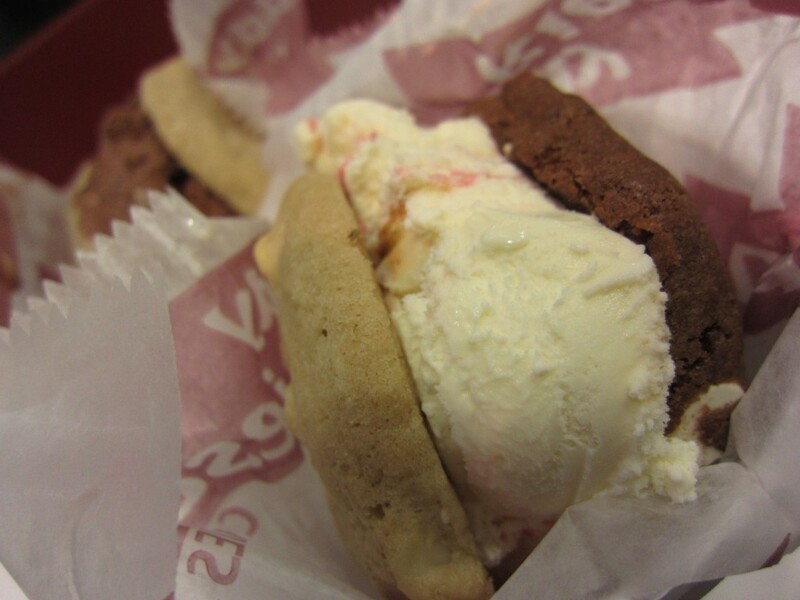 The cool thing about Diddy Riese is that you can custom make your ice cream sandwich. 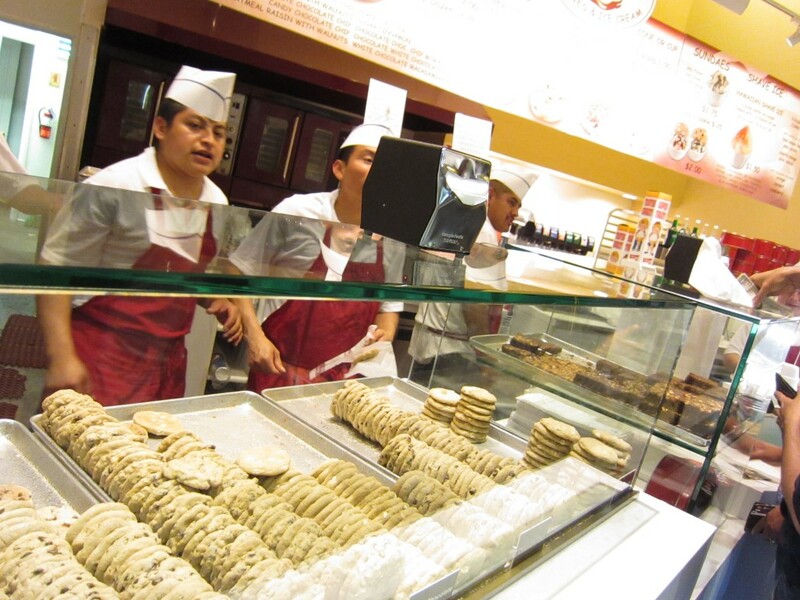 You can mix and match from 10 different cookies, and they offer 12 different ice cream flavors. You basically choose your cookie or cookies, and choose a flavor of ice cream. The people who work there aren’t really friendly, but they get the line moving. It’s no the best ice cream sandwich, nor is it the best cookie. But where else can you get a cookie ice cream sandwich for $1.50? Nowhere. Don’t think you will get all these exotic ice cream flavors and unique cookie combinations here. This isn’t Cool Haus. You get straight up classic Dryer’s Ice Cream in between a classic cookie combination. This is definitely a perfect end to a good night. Once in a while, you come across something so cool and delicious. You eat it, and realize what you are eating, and you ask yourself, “why didn’t I think of that? 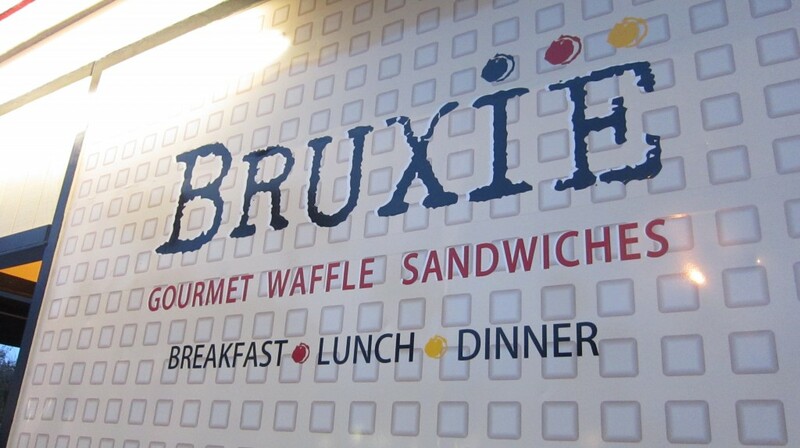 !” Bruxie is a gourmet waffle sandwich shop located in Orage, CA. It is close to Orange Square where we have Felix Continental Cafe, Rutabegorz, and The Bruery Provisions. 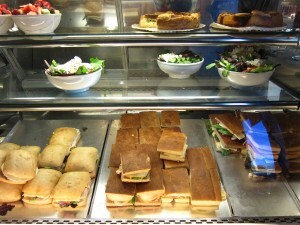 It looks like Chapman University students, who are only steps away have no problem having to choose where to eat. They offer a huge variety of waffle sandwiches. Savory treats include a play on salmon & lox, cheese burger, and bacon & eggs. For the sweet tooth, smores, PB&J, nutella & bananas, and even red bean with sweet cream. It was hard to choose, and impossible to eat them all. We ordered the prosciutto & Gruyere, buttermilk fried chicken & Waffle, lemon cream & berries, and a strawberry lemonade to top it all off. Prosciutto is my all time favorite cured meats. 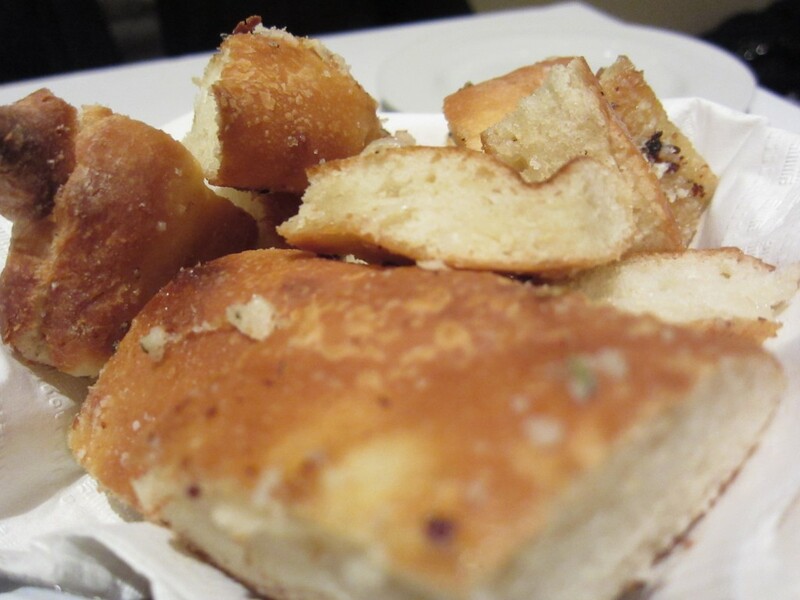 It’s fatty, salty, and so buttery delicious. 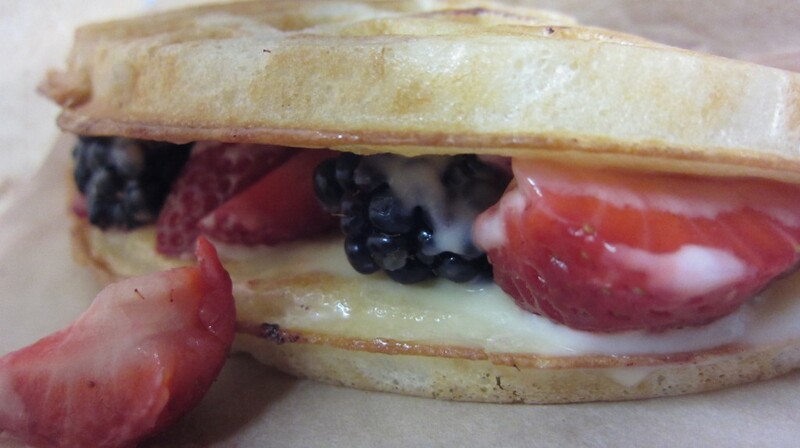 How much better is it on top of melted Gruyere cheese and inside of a nice crispy waffle? Nothing tops that. The best part was the whole grain mustard and chives. 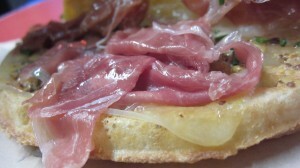 It had the perfect acidity to cut the richness of the prosciutto. The amount of meat they put in the sandwich makes this worth every penny. 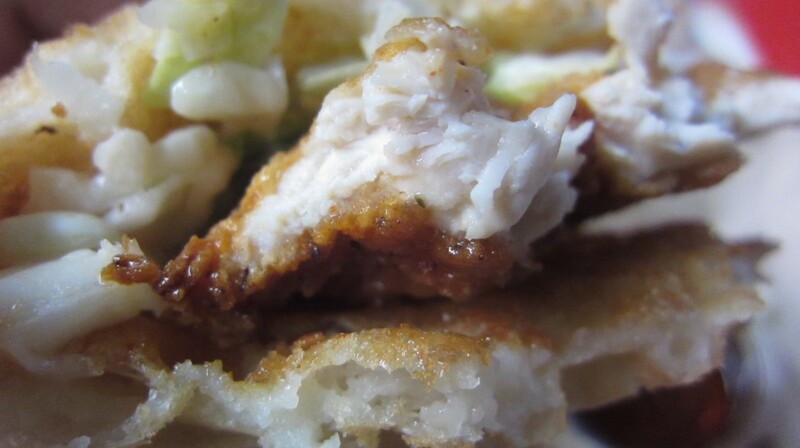 Next in line was the buttermilk fried chicken and waffle. I am a sucker for sweet and savory — This definitely hit the spot. The chicken is a huge piece of breast meat, and the flavor is so clean. The slaw they put inside gave the sandwich a nice contrast of flavors and textures. I wish the chicken was a little crispier, but after drenching the whole thing in the syrup, it all doesn’t matter. What matters is all that sweet and salty goodness going in your belly. For dessert, we had the lemon cream and berries. The best part was the cream. It had a little zing from the lemon, but not overly sour. There was no pucker factor, which was a good thing. The berries were fresh, good in itself, but each bite having a little of the fruit, the cream, and the Belgium Waffle made this an instant classic. That is the think about Bruxie. They have traditional ingredients all packed inside of a Belgium Waffle. They are easy to eat — kind of like a giant taco. It is unique and different and better than any old sandwich shop or breakfast diner. This is how I see it. Breakfast: Bacon, egg, cheese Bruxie. Lunch: Prosciutto Bruxie. 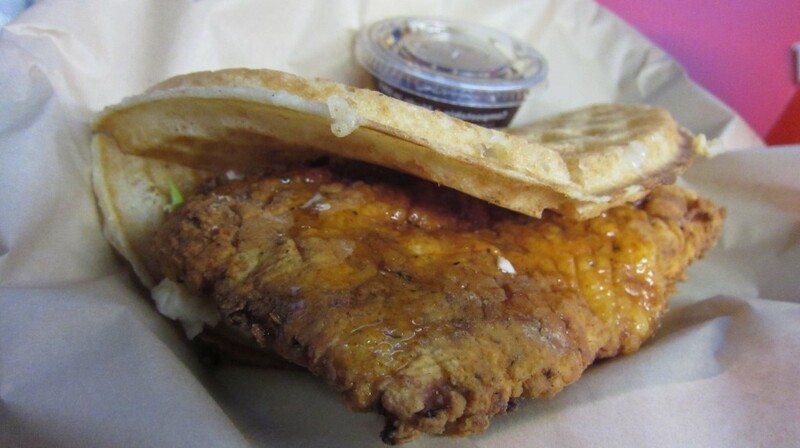 Dinner: Fried chicken Bruxie in one hand, Nutella Bruxie on the other. Next day, repeat with different ones, and so on. Also, be on the look out. A new location will open in Brea, CA in November! 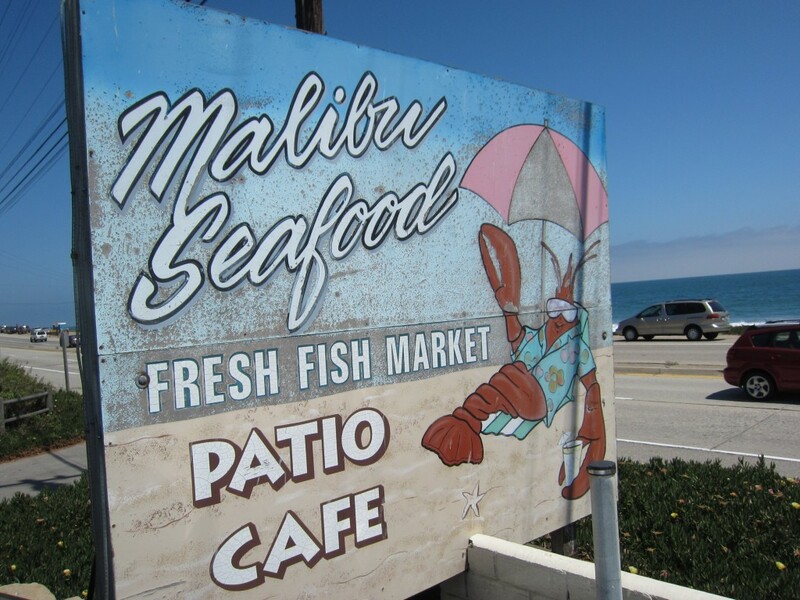 Malibu Seafood is a small stand situated on the Pacific Coast Highway, just at the start of Corral Canyon Park. 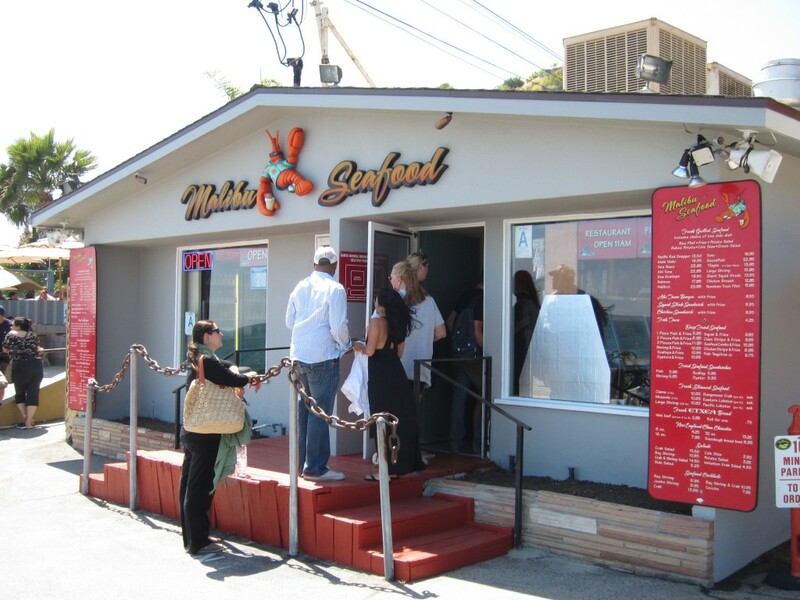 People cruising down PCH can stop at this small shop and find some of the freshest seafood. There is a small fish market inside as well as a tank of lobsters and crab. Everything looked fresh — No wonder there was a line almost out the door. 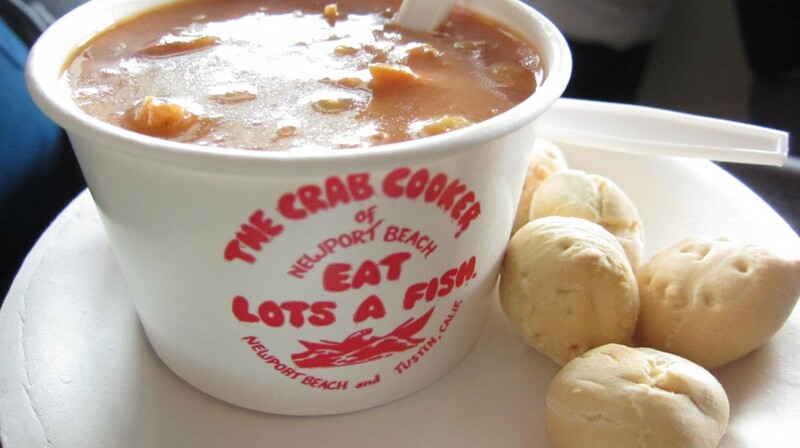 I always try to get the clam chowder. If it is on the menu, I will most likely get it. 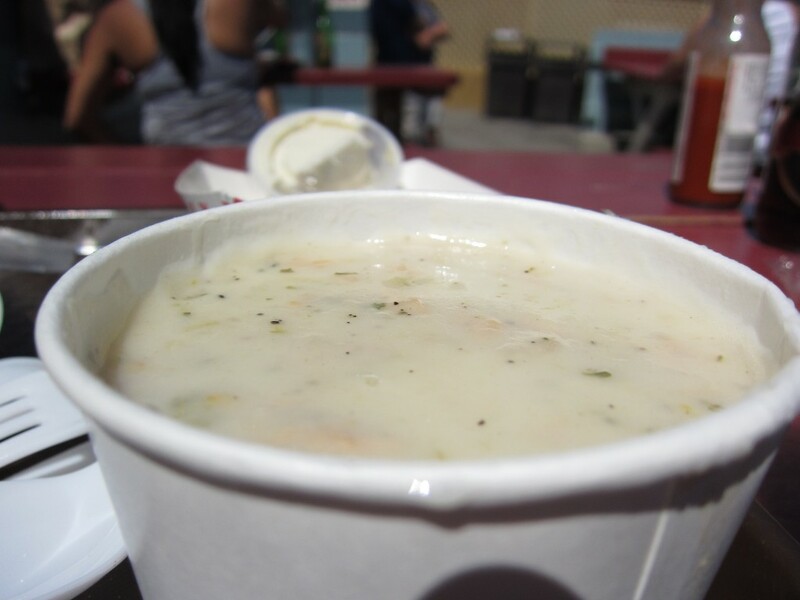 You would think that a seafood spot right next to the beach would have the perfect clam chowder. That isn’t always so. 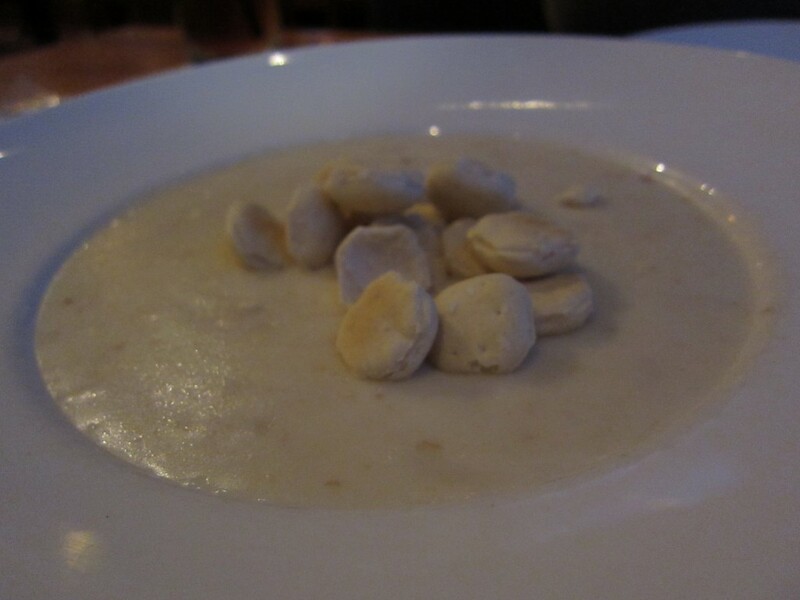 Though the clam chowder was tasty, it lacked a good thickness that I like. Maybe I am being too particular, but I like my chowder thick, almost like the consistency of oatmeal or grits. Anyways, it was a good start nonetheless. 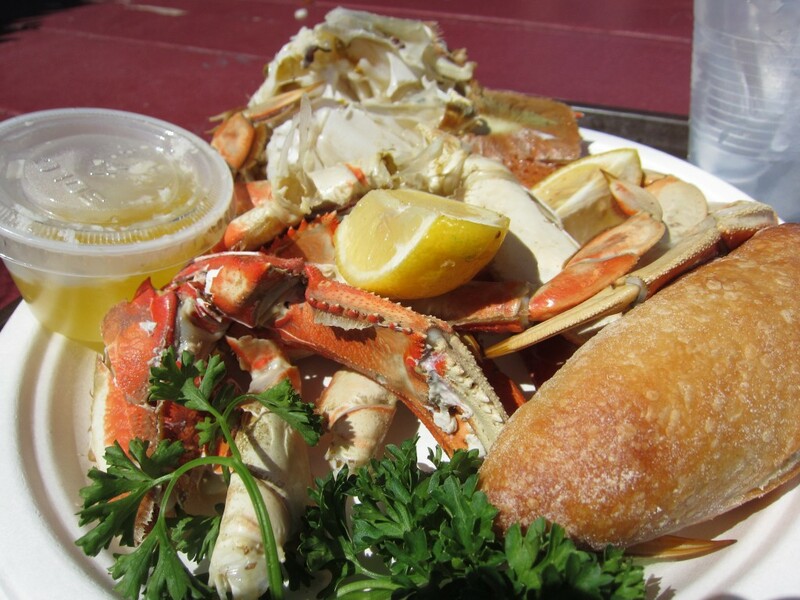 We could not resist the fresh dungeness crab. Just recently, I enjoy eating this stuff. Before, it was a chore and didn’t even bother trying to eat it. After learning how to dissect the legs and body, and figuring out how to get into all the nooks and crevices, I learned that crab is delicious. 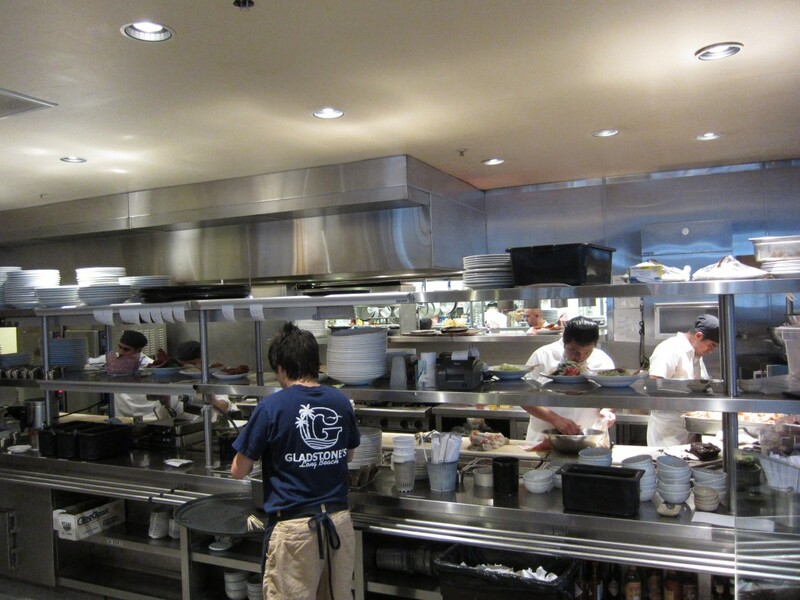 At Malibu Seafood, the meat was fresh and cooked perfectly. I was a little disappointed that the flavor of the crab was missing. It was as if the salty seawater flavor was gone. Luckily, we had butter to save the day. What I did like was their fried oysters. Popping them in my mouth, it was an explosion of ocean flavor. The breading could have been a bit crispier, but the oysters were definitely fresh. It had an amazing flavor, and I have to say, oysters are so good. They are like highly concentrated sea flavor in a shell. Awesome. What is better than fresh seafood off the side of the PCH? The cool breeze with the view of the ocean and eating good seafood. This is what the beach is all about. Los Angeles has some good beaches, and Malibu is one of the finest. The beach and seafood go hand in hand. If you are on the PCH and see this establishment on the side of the road, stop and see what all the fuss is about. 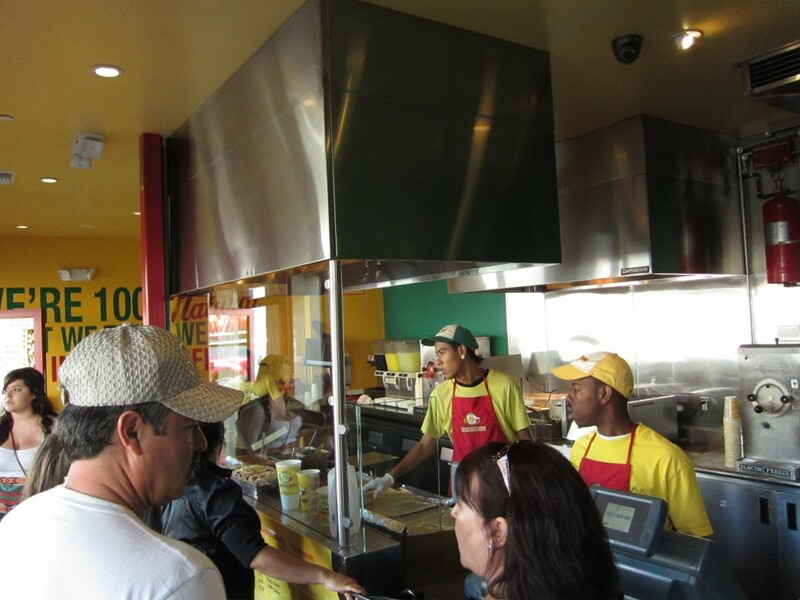 Los Angeles has some good Mexican food, maybe the best in the world. Though that may be a stretch, I know we are pretty close. 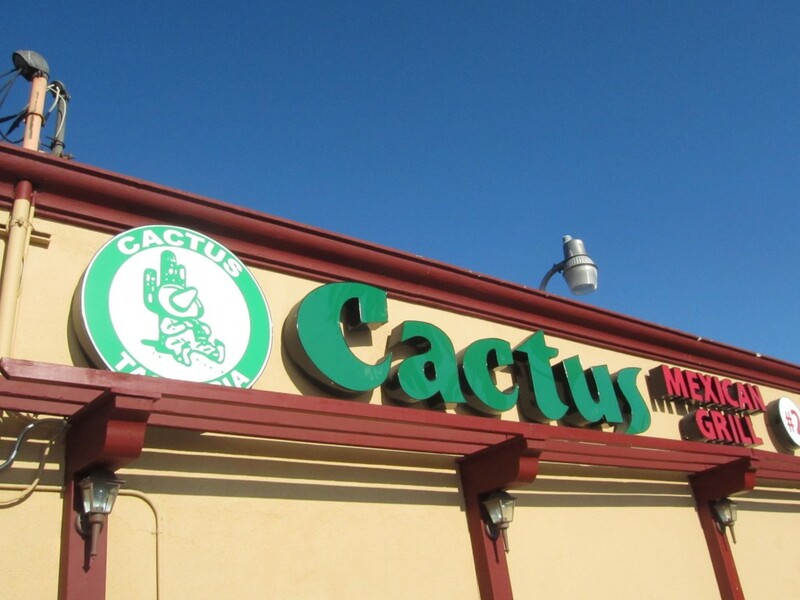 One of my favorite snacking spots for some tacos is Cactus in Los Angeles. The meat here is like no other. 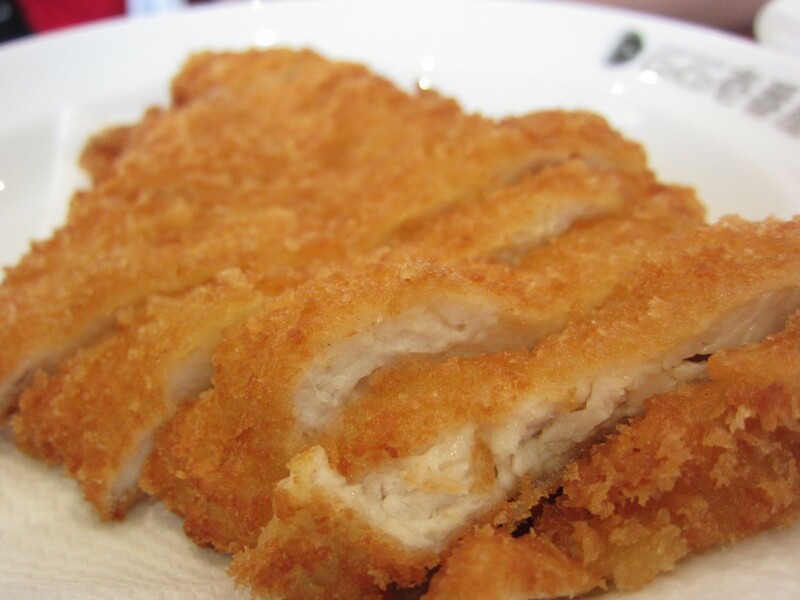 It is almost over cooked to a crispiness, but it is so delicious. It is not too salty, and not really bland either. My favorite is their carne asada or their lengua. Lengua, being cow tongue, seems weird, but it is some of the best part of the cow. For anyone reading who hasn’t tried lengua before, please try it. 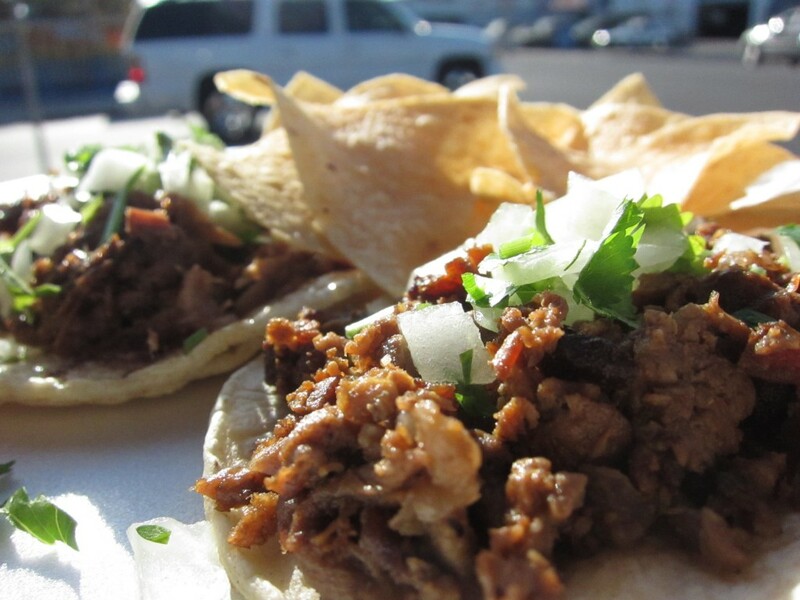 You will never go back to carne asada ever again. I don’t want to say it, but the tacos are even better than the King. There comes a time where Italian food is all you need. You got carbs cooked to perfection, oils and sauces of your liking, maybe some kind of protein, and cheese. Simple goodness. This is all I want from Italian cooking. Maybe I totally ordered the wrong dishes, or this place isn’t what its all cracked up to be, but Mi Piace in Pasadena did not do it for me. 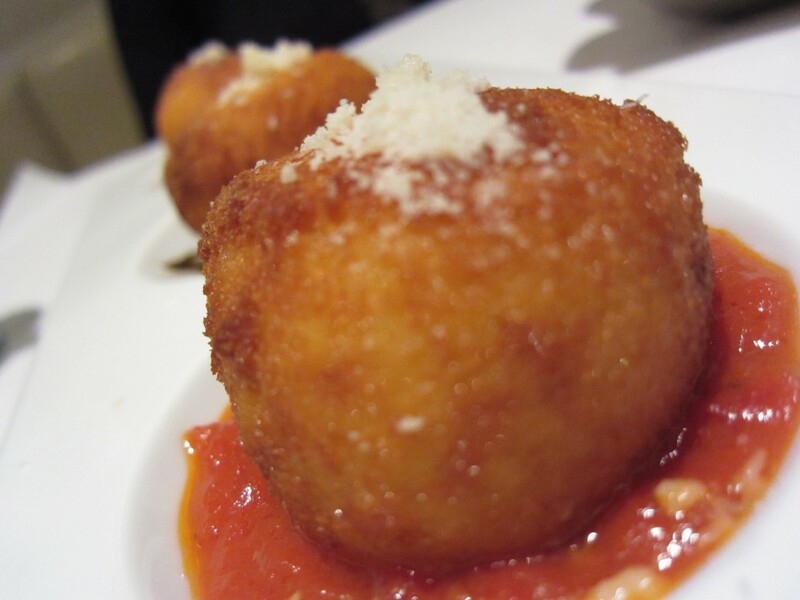 We started with a fried risoto ball with mozzarella and marinara appetizer. The inside was warm and cheesy. It tasted good, but it had a unique seafood taste. It might have been natural, maybe not, but it was a taste that seemed like an artificial seafood taste. I am a sucker for fresh dough. I was sad to find out that the ravioli was not hand made. Their Ravioli di Constine. 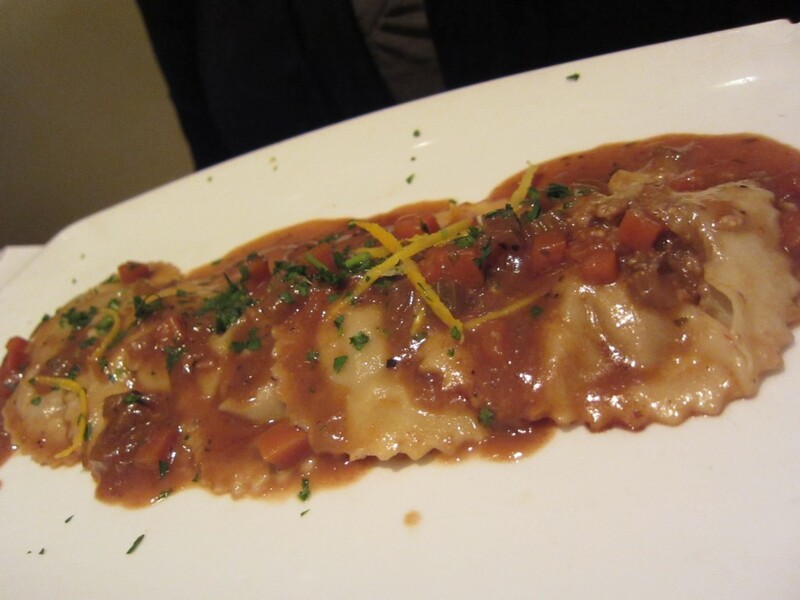 It was a fresh made ravioli filled with braised short ribs. The sauce was a brunoise with orange zest reduction. This was unique and delicious in its own way, but the lack of fresh hand made dough was a let down. Also, no cheese or cream made this dish not one of my favorites. Rarely do I get a soup as a main dish. But this soup dish was as hearty as can be. The linguini al pescatore had calamari, scallops, shrimp, clams, prawns, and mussels. I got it with spinach linquini with white sauce. 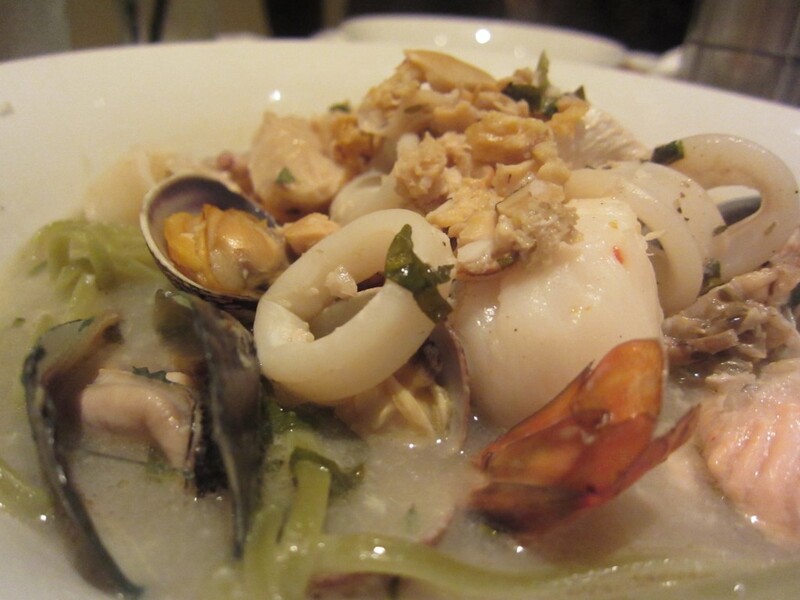 This rustic seafood soup was hearty, but the taste was just not there. The broth had no flavor — It was basically seafood water. Some of the seafood was overcooked, and everything tasted the same. The saddest part was that the noodle wasn’t really al dente. We ended our meals with some of their treats from the bakery. 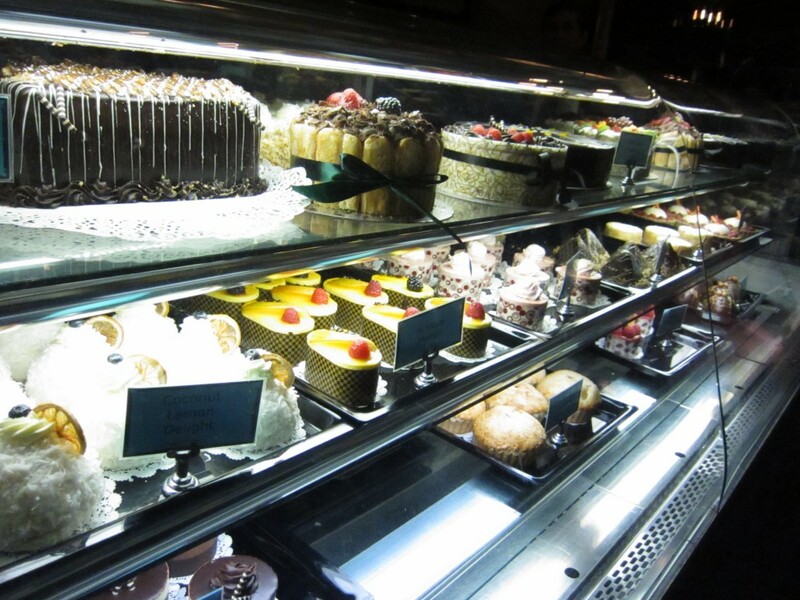 Their bakery had a good selection of tarts and cakes. Something sweet for later, I guess. Honestly, I would try this place again. Something with cheese maybe next time? Something more traditional? Well, I am a sucker for complimentary bread. I want to give this place another chance, because I really want to like this place. The interior was trendy and romantic. The kitchen seemed like they knew what they were doing. But for now, at this moment — “mi no piace”. Walking around Newport Beach, I basked in the sun and enjoyed the simple life of a beach bum. 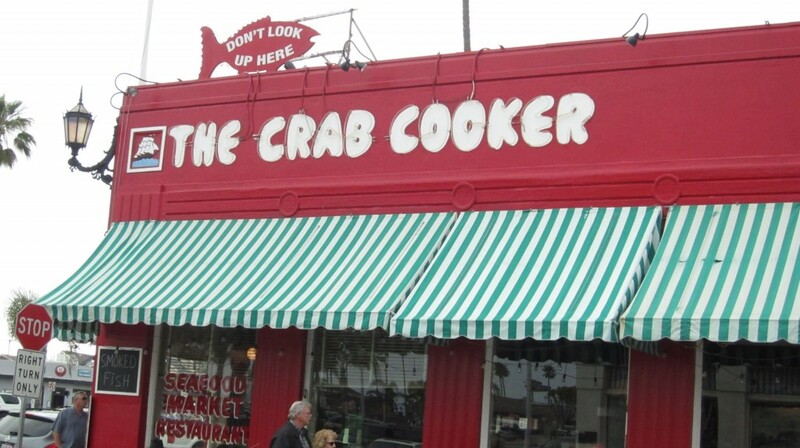 I check out some shops, the harbor, and little eateries — I came across The Crab Cooker. 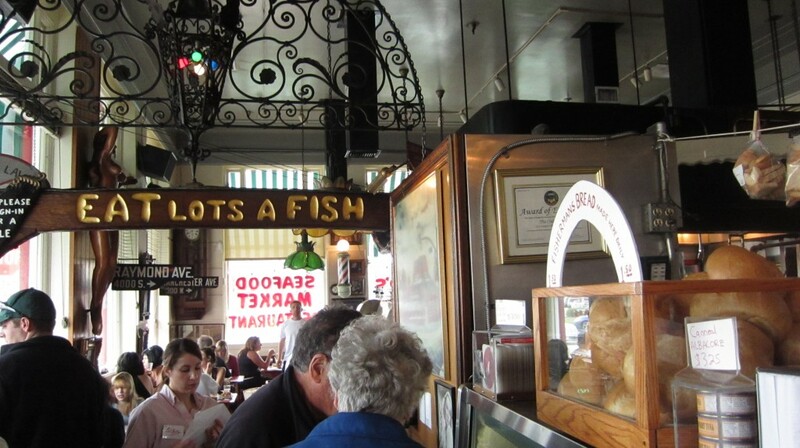 Upon entering, I saw a mini fish market along with people waiting in line to eat. I didn’t want to dine in. I just wanted a warm cup of their clam chowder. Waiting form my soup, I had a chance to check out their market. They sold smoked salmon and albacore, lobster, scallops, they had it all. I had a sample of the fish salad they use for their sandwiches and it was great. The interior was great at the feel of it really fit in with Newport Beach. 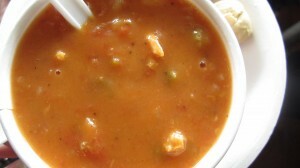 Interestingly, their clam chowder isn’t like anywhere else — Theirs was tomato based. Intrigued, I thought it was really hearty and flavorful. The vegetables tasted great and the clams were meaty, though I would have liked full bodied clams a bit more. It was especially good eating it with the cracker balls they gave us. Also, since it was tomato based and not cream based, it meant it was healthier too. 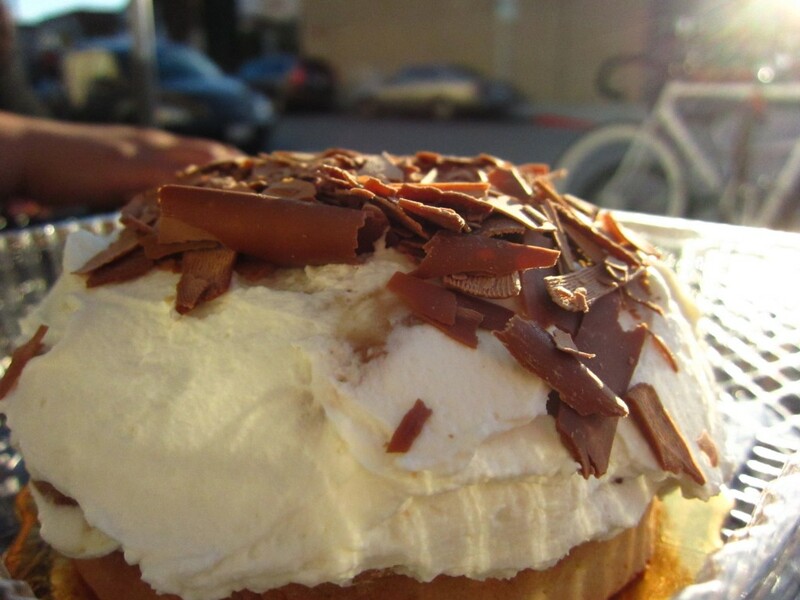 This cute little bakery is really what Los Angeles needs more of. 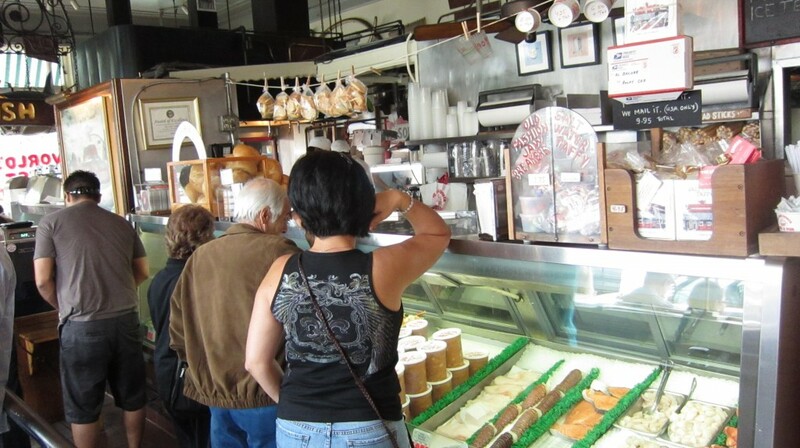 Quickly, Los Angeles is losing that touch of sidewalk cafes and corner bakeries. If you go to London, Paris, or New York, sidewalk cafes and shops are all scattered throughout town. On your daily commute, you can easily pass by a handful of shops that are all popular to locals. Why is it that Los Angeles doesn’t have a lot of these? 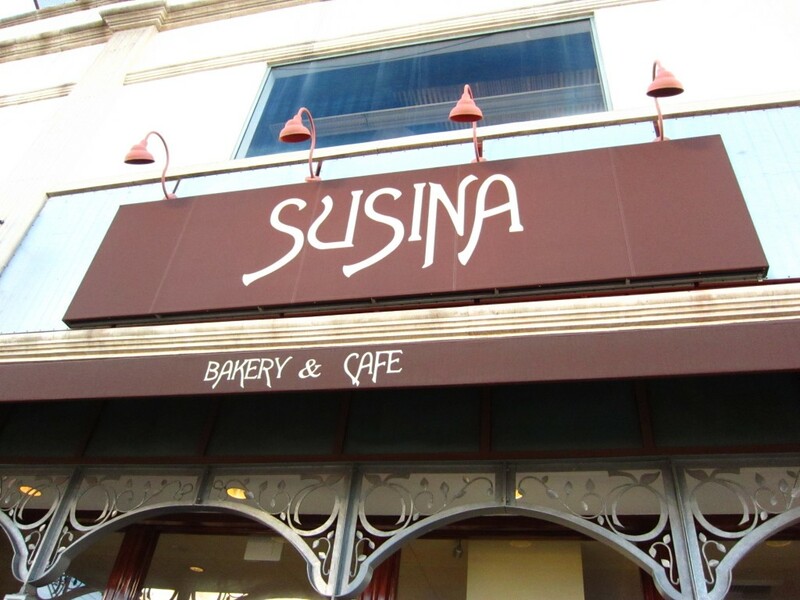 Well, it is refreshing to know that Susina Bakery and Cafe, once called Sugar Plum is standing its ground. Walking in, there is a whole display full of goodies. The cakes, pies, and other pastries all looked delicious. They also have drinks and sandwiches. 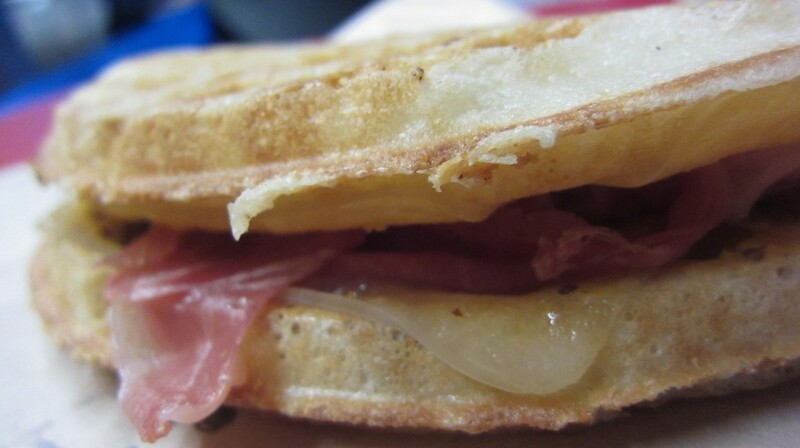 The panini sandwiches were not bad, forgettable though. Probably because I had my eyes on the sweet stuff. 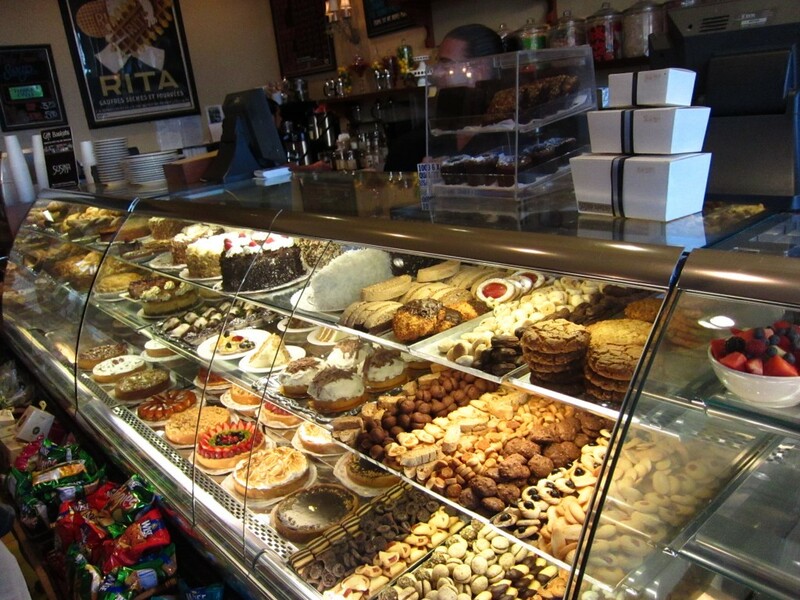 I think people go here for their pastries and baked goods. 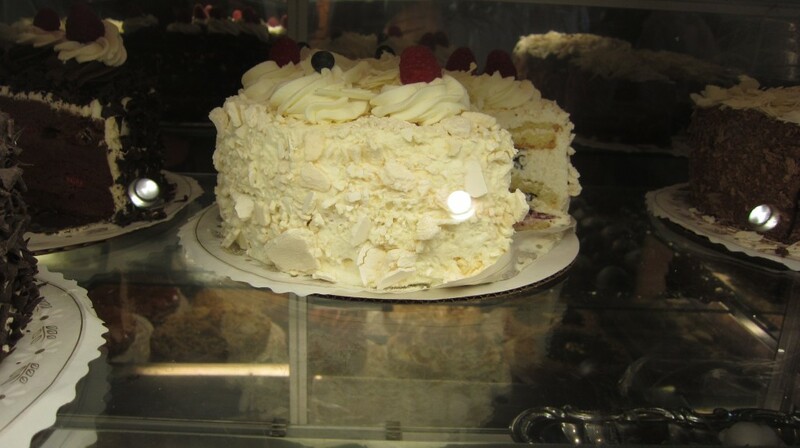 What people mostly come here for is their banana cream pie and the berry blossom cake. I had a chance to try both, and I am sold. Their banana cream pie was fantastic. The hard cookie crust with the chocolate covering, filled with their unforgettable banana cream with fresh bananas all come together to make a wonderful dessert. 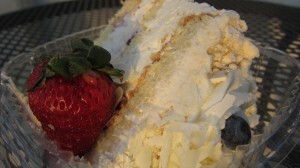 This is then topped off with a heap of whipped cream and sprinkled with chocolate shavings. The cold banana filling inside mixed in with the cookie crust in every bite really is amazing. The berry blossom cake was great too. We had the pleasure in having the first slice of the whole cake. Interestingly, the cake was too moist, almost wet. The texture was not cakey, but more like a moist bread pudding or like a tres leches cake. The berry flavors were subtle, yet tasty. I kind of wanted more of a cake bite to it, but it was tasty nonetheless. Maybe my expectations were wrong. The flavors were really complex — it’s not your ordinary cake. I might have to get it again next time just to put my finger on it. Susina is great little bakery shop. Eating lunch here, sipping on some coffee and cake, working on a post would be pretty relaxing. Every time I come here, I try to at least leave with a banana cream pie or a cake. Come to think of it, I wish I was there right now, enjoying those treats, writing this post. How perfect would that be? Well let’s see. I can say that I have had my share of good burgers. Some were the huge messy kind, some the simple and delicious kind. 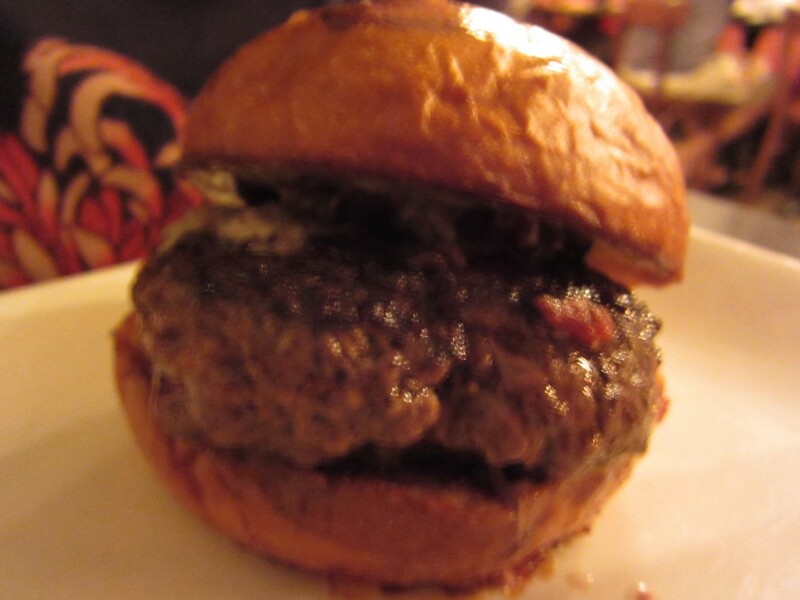 I have tried the burgers at Umami Burger a couple of times. I want to like it because so many people say it is so good, but I can honestly say I don’t care for it. I do like the interior. It reminds me of some kind of underground Japanese sanctuary. The dim lighting and candle light like ambiance gives it a relaxing aura. 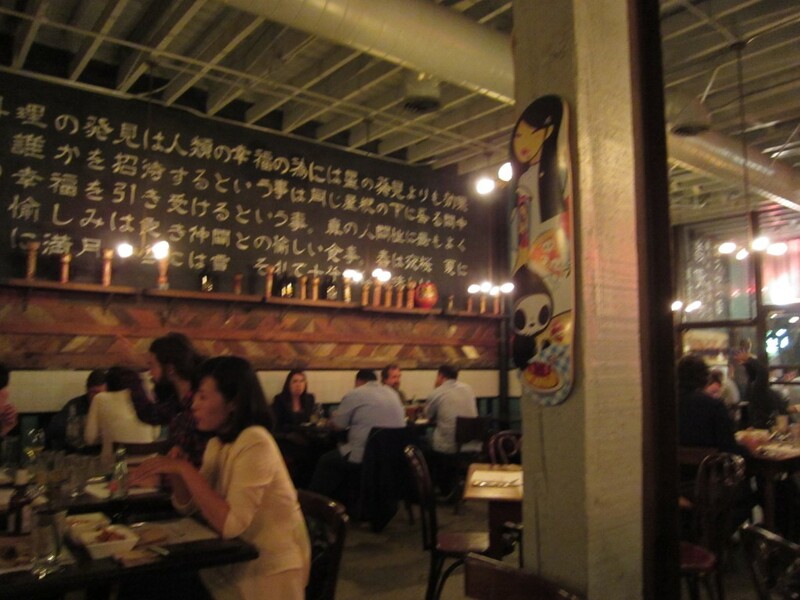 The Japanese accents and writings hint that you won’t be getting your all American burger here. So what is umami? It is what the Japanese call, the fifth taste. It was thought that our mouth had only four primary tastes (sour, butter, sweet, salt). Supposedly, umami is the fifth primary taste. It is described as a savory taste. 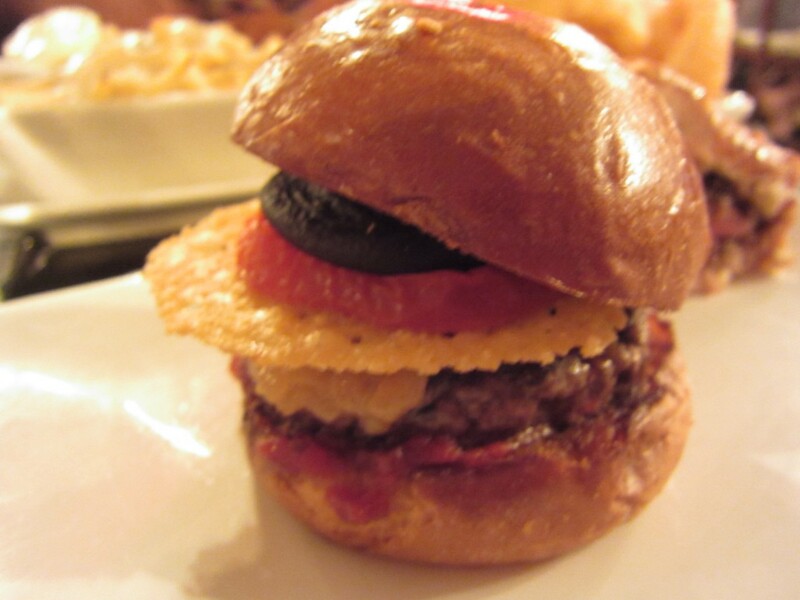 The burgers at Umami burger are small. One can easily make the mistake to think that these are sliders. Given the small size, I gave it the benefit of the doubt that good things come in small packages. The taste was like no other, I will give it that. It almost tasted like a meatball sandwich with marinara. Come to think of it now, it was interesting. Maybe I was a bit harsh earlier saying that I didn’t care for it. Maybe I am too caught up in the traditional cheese burger that I cannot appreciate it. Whatever it may be, I still stand by my first statement and will look elsewhere for the perfect burger. We had two of their sides, one I liked, one I did not like. 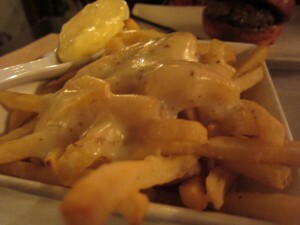 The truffle cheese fries were really delicious. The cheese was melted on top and the aoli on top was great with it. 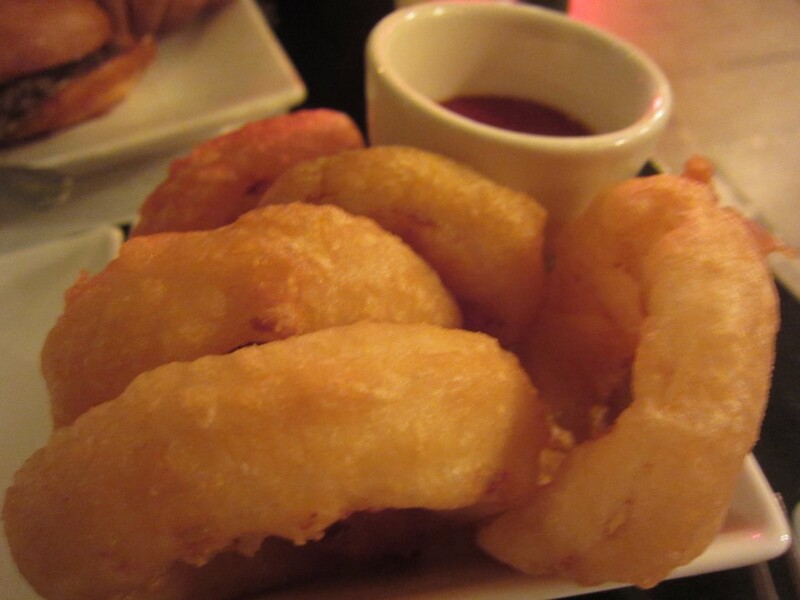 We also ordered the onion rings, which tasted like nothing. The tempura batter on the outside had no taste, and though their umami ketchup was interestingly tasty, it did not save the onion rings. If I had it my way, maybe some kind of soy sauce aoli would have worked well with the onion rings. They could even call it “umami aoli” and people will flock to it. Heck, throw on some “umami” salt on the rings and call it a day. Why am I being so harsh to Umami Burger? I don’t know. Maybe it is their pretentious attitude towards food? I think it has to be their portions. But in all honesty, I guess that is all part of the experience. 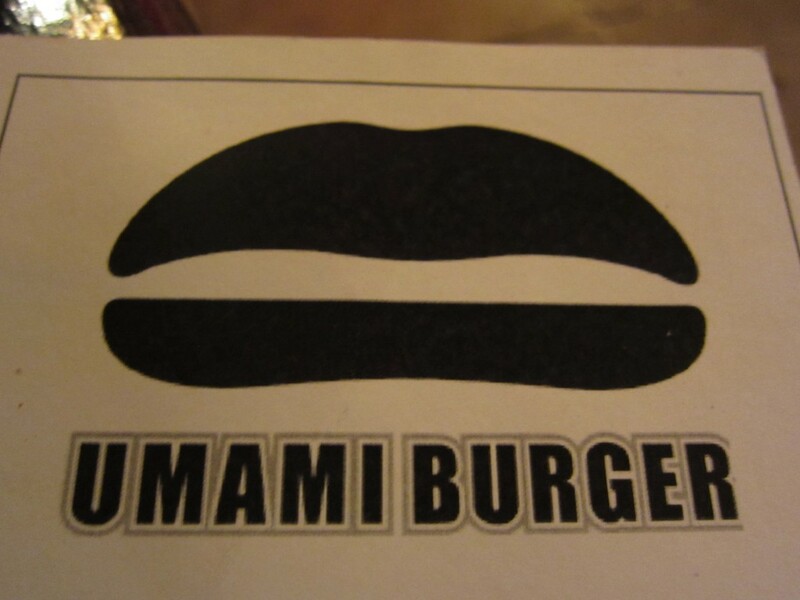 Umami Burger is not for everyone I guess. I hate to write a negative blog post, but this one will be it. People don’t only need to know what is delicious out there, but they also need to know what isn’t. 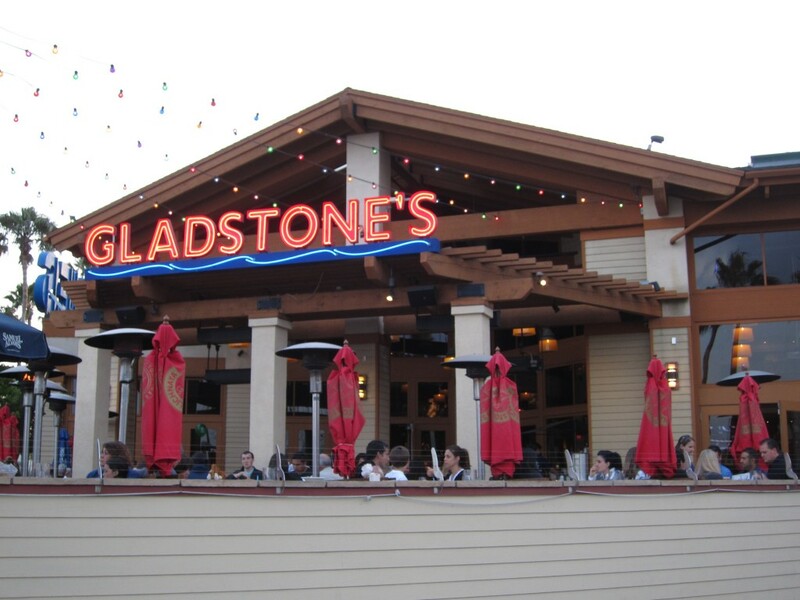 Sadly, Gladstone’s in Long Beach was not. Every quality a good restaurant should have, this one did not have it. Not only was the food terrible, the service was just as bad, if not, worse. The prices on the menu were so high. The atmosphere was not fitting to the price of the food. Waiters were in shorts and shirts. Something about that was kind of tacky. With their high end prices, this place sure didn’t feel high end. Service was a joke. We had to honestly stop 3 different people for bread — and finally given bread in the middle of our meal. The poke bowl was so so. It looked good, but it wasn’t really amazing. 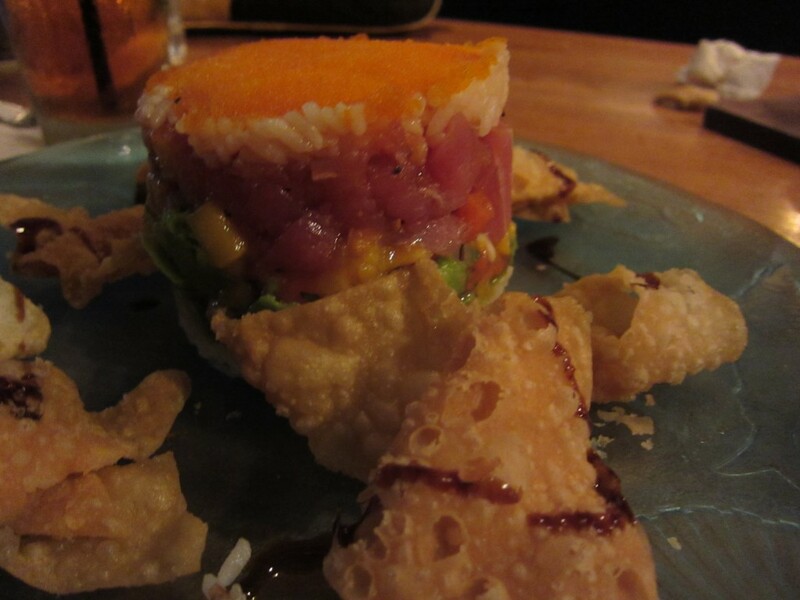 The raw poke was good, but I am a sucker for raw fish. The rice is what makes sushi items like this what it is. It has to be cooked al dente and needs that special touch. The rice for this dish was weirdly sticky and mushy, yet seemed undercooked. All in all, this was okay as an appetizer, but not a full entree. 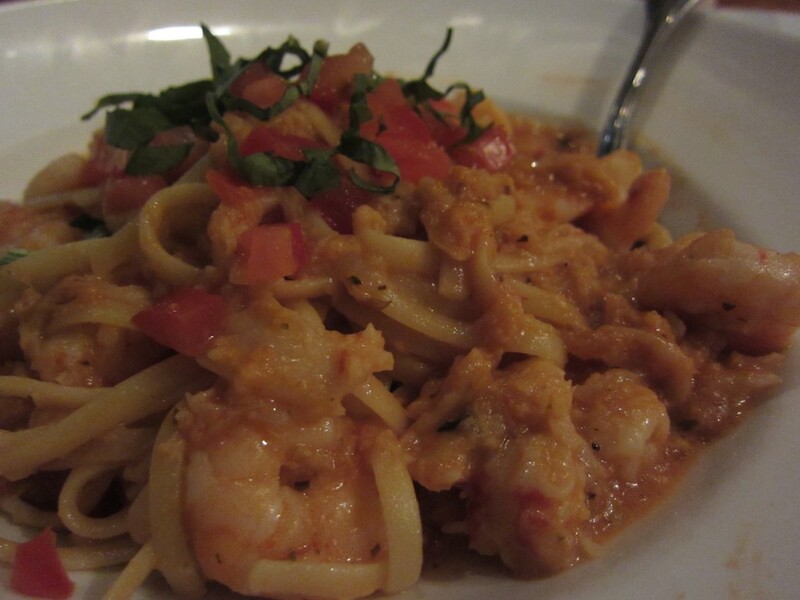 I am a seafood pasta fan, but Gladstone’s doesn’t specialize in pasta. At least they supposedly specialize in seafood. The noodles were kind of over done, and the seafood didn’t taste like seafood. It was as if they washed away all the seafood essence of the clams and shrimp. All you were left with was a tasteless sauce, stale noodles, and bitter chopped basil leaves. Honestly, they need to change their whole restaurant upside down. The one thing going for them? 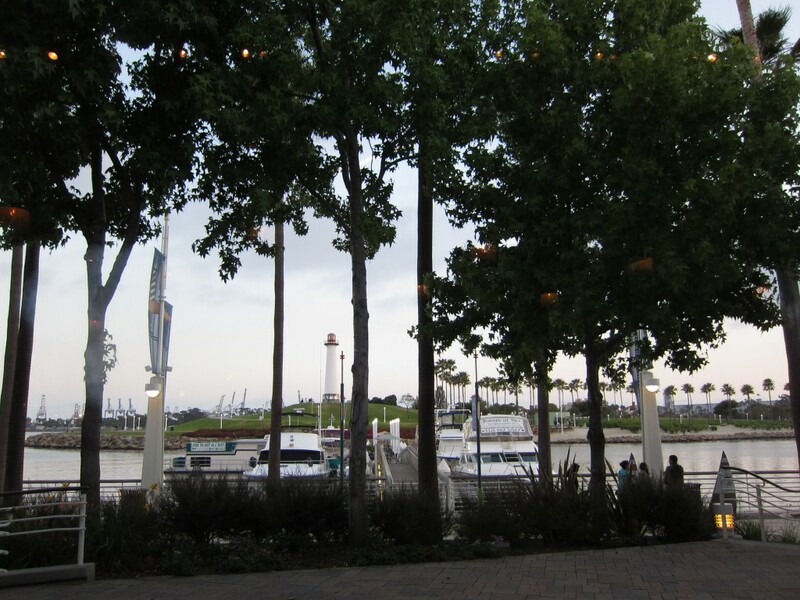 It is at Long Beach, with the view of the water. 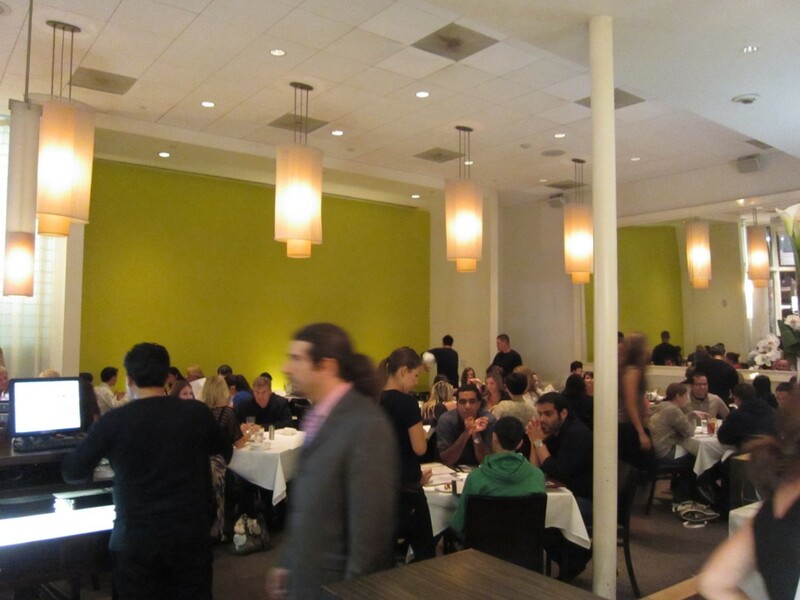 The service needed to go up a few notches, the food could either stay the same or the price could go down — If I had it my way, the place would get a bit classier. The price could stay the same, or a little higher with smaller portions with a much tastier menu. I am sorry. The ice cream at the boardwalk was much better. Gladstone’s at Long Beach, never again.